It's 1996 and the wizarding world has officially gone straight to hell. In Great Britain, an evil wizard once thought vanquished is rising again, and his cadre of insane zealots have been freed from prison to once again wreak havock upon the world. And they'll probably bring about the end of the days with the metric system, tooth decay and the most awful cuisine known to man. Seriously, they're Brits. Sure, Brits make great bad guys in American movies because of the accent and such, but as a whole, they could give church mice lessons on being mild mannered. We're Americans. The stuff going on across the pond barely gets a raised eyebrow out of us. It barely rates a place on Page 5, and most of us turn past it to read the funnies, anyways. Our country was founded by mudbloods, half-breeds and blood traitors -- The people that the old, powerful, pureblooded families didn’t want around. We do things a little differently around here. Nobody talks about blood purity here because we’re all Heinz 57. We don’t go shopping in dark, musty alleyways; we have our own shopping malls. House elves aren’t slaves out here; we freed them more than a century ago whether they liked it or not. And we have our own problems. An evil cabal is on the rise: The Seven Deadly Sins. Nobody seems to know what they want, but they seem to be obsessed with the Salem Institute. Students have been kidnapped and even killed, and nobody seems to know when the terror will come to an end. But we're not hiding under our beds. It's time to stand your ground and fight back! Play students and/or faculty at a middle and high school in the USA. Take over one of the site canons or bring in an original character. Create regular witches and wizards, werewolf, part-giant, part-goblin, animagi, metamorphmagi, and more. Special races and abilities are limited, so get them while you can! New players are limited to two (2) characters for the first month. Join in on the board-wide plots and events, or concentrate on personal plots, or do both! No word count or post length requirements. We accept newbies and veterans alike! Small group so your character won't get lost among the masses. Board is over a year and a half old and still going strong. We're not just another Hogwarts clone. 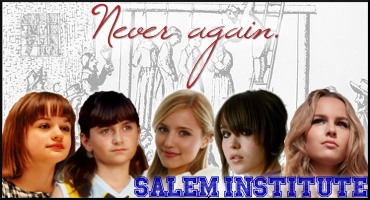 Salem is quite different from Harry's alma mater.